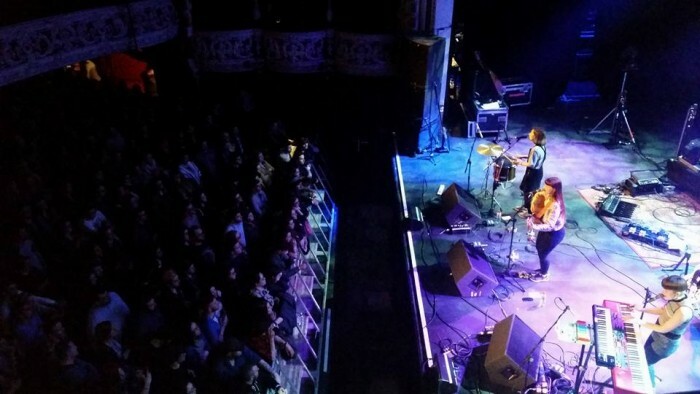 When I walked into the Olympia Theatre, Dublin to watch I SEE RIVERS play their support slot to indie-folkster Newton Faulkner, I had little to no idea what to expect, having never seen them play live and with just four songs on their SoundCloud to reference. Of these uploads only one is self-penned, while the other three are covers of songs by ISR favourites, selected and recorded to soundtrack a dance show being produced and choreographed by a friend. I SEE RIVERS is Eline, Gøril and Lill, young, vibrant, extremely talented musicians hailing from three of the four corners of Norway. They moved, separately, to Liverpool, where having met and befriended each other, found that they made a pleasant enough sound together and so set up their ‘float folk’ stall. 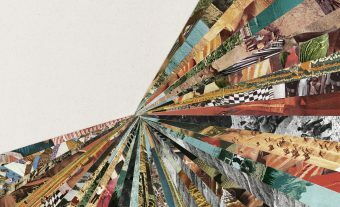 Since then they have focussed on experimenting with and evolving their unique crystal-tipped uplifting indie-folk sound. They took to the stage in front of a packed capacity crowd of approx. 4,000 without batting an eyelid. This barely-there, unsigned trio of newbies hopped, skipped, danced, chatted, bantered, laughed and sang, totally enchanting their instantly captive audience. I’ve been to gigs in the Olympia where you couldn’t hear the support act for talking; this was not the case with I SEE RIVERS. Centre-front of this youthful three-piece was Gøril, who immediately engaged with the audience; within a matter of minutes they were putty in her hands. Meanwhile, the Riverdance twins Elina and Lill went into spontaneous Irish dance overdrive, stepping it out to the delight of the crowd Now that is how to win over an audience kids – make them laugh, get them conversing and most of all, make ‘em SMILE. Smile and the world smiles with you and smile is what these girls did, A LOT! Kicking off the set with their single, ‘Loved Ones’, they gave a joyous performance of this gorgeous song. Notwithstanding the fact that the track was unknown to the crowd, they showered the trio with cheers and roars of approval which augured well for the rest of their forty-minute set. I SEE RIVERS sing in close harmony, with one taking the lead – mainly alternating between Eline and Gøril – with a dual vocal accompaniment of higher/lower harmonies. 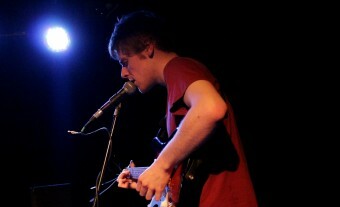 Instrumentally, they play keys/xylophone, acoustic guitar and drums/electric guitar. Their style, which is refreshingly ‘unstylised’ and natural, is all the more enhanced by their disarming positivity, uninhibited confidence and youthful exuberance. Get the picture? Spurred on by the good humoured banter and positive energy flowing from the crowd, the trio moved through their set, playing songs with Norwegian, mythic or oceanic themes. The poignantly emotive ‘Feathers’ brought a hush over the auditorium; a song about a sole survivor of the plague in a northern Norwegian town, it was delicately evocative without being mood-killingly dull. The vast sapphire expanse of the ocean was beautifully conveyed through the poetic lyrics of ‘Oceans’, which was possibly the best song of the night. The cold darkness of the waters surrounding their native Norway licked around the edges of the song’s melody while Lill’s pretty nifty cymbal shimmers spoke of icy waves lapping against the harmonies. Wonderfully imaginative stuff, with a powerful yet pristinely controlled vocal combo. 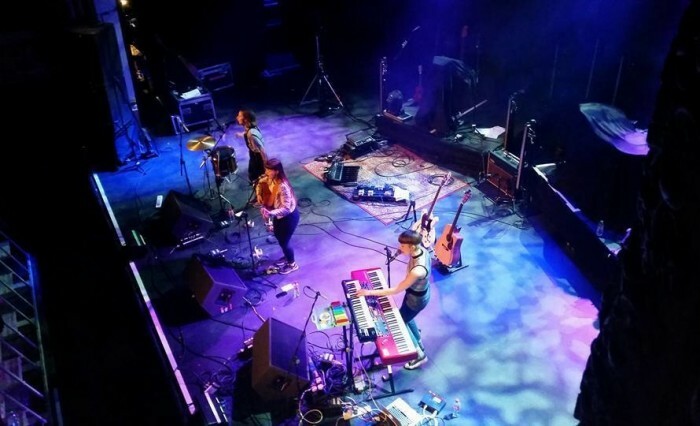 They wrapped their set with the atmospheric ‘Barefoot’, with its quirky percussion and divine harmonious acrobatics, but only after they had taken a ‘filmie’ of the thronged theatre, much to the approval of the wolf-whistling crowd. IRELAND // DUBLIN! Don’t think we have played for a happier crowd than you guys! Thank you for a great night ❤️ Prepare yourself Newton Faulkner, these people are crazy (in the BEST way). Although they are still unsigned newbies, I SEE RIVERS know how to work a crowd and win them over. More importantly, they know where their skills lie and play to them brilliantly. They craft songs that enhance rather than overshadow their delightful ice-dipped vocal weave, with lyrics that are so poetic they could stand alone without musical accompaniment. I first heard I SEE RIVERS when they uploaded a song to the BBC6-supported Fresh on the Net. As luck would have it, I was on reviewing duty that week, and so intrigued was I by their fresh-voiced, unpretentious happiness that I’ve kept an eye on them ever since. After having seen what was without fail one of the most uninhibited, enthusiastic and fun performances of 2016, topped only by that of Rick Ashtray in Trondheim, I’ll be keeping an even closer eye on this band’s progress in the future. I SEE RIVERS continue their UK tour with Newton Faulkner until 23rd April, details on their Twitter page.